STILLWATER, Okla. (June 29, 2018) – If their hands could talk, they’d have some stories to tell. Scars, scrapes, bumps and bruises on their forearms and lower legs are evidence of some battles and could serve as an introduction to the hands’ tales. 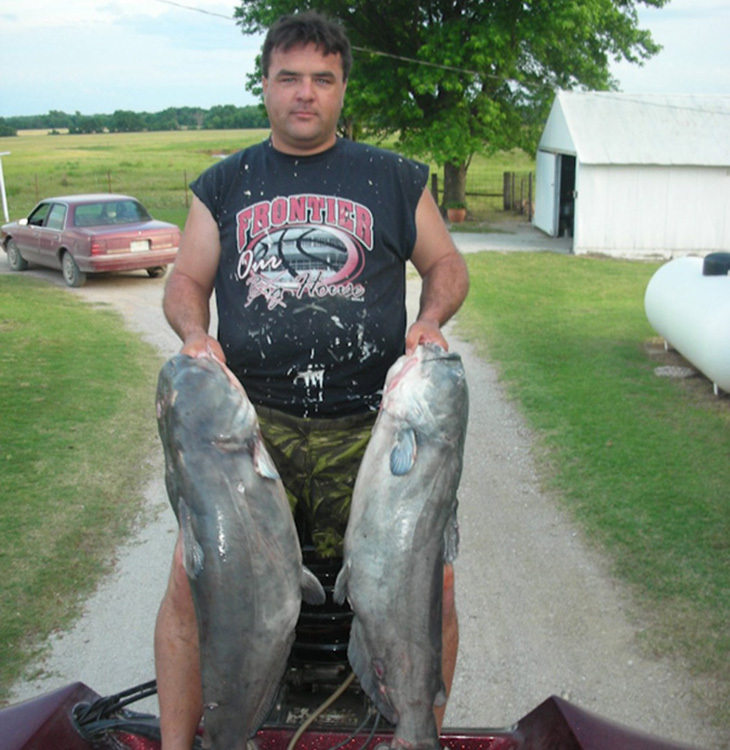 Grant Williams, Morrison, Oklahoma, has spent the majority of his life noodling Oklahoma waters for catfish. For 30 years, lifelong friends and Morrison, Oklahoma, residents, Erick Ring and Grant Williams have used their hands as bait to harvest countless catfish from Oklahoma lakes, rivers and streams. They are just two of the many, many Oklahomans whose favorite past times include hand fishing, commonly known as noodling. The idea of hopping into water, anywhere from just a couple feet deep, down to well over your head, to feel around for giant fish sounds crazy to some. But being waste deep in muddy water, armed with a pair of gloves at the most, is exactly where noodlers want to be. Spawning season for catfish in Oklahoma runs from May through July, give or take, based on weather conditions. Noodlers will feel around for holes or cavities under rocks, logs and brush piles in search of the season’s nest. Once a hole is found, a noodler will insert his hand, or foot, hoping a monster cat will latch on. It’s the adrenalin rush and freezers full of meat that have kept Ring and Williams going through the years. Joined by fellow hand fisherman Shawn Walls, Stillwater, Oklahoma, at The Great White Buffalo Tavern, the three sat and traded some of their favorite stories and memories of enjoying Oklahoma’s great outdoors. Ring said he learned hand fishing from his older brother, and while he doesn’t actively noodle nearly as often as he used to, he still enjoys being out on the boat and in the middle of the action. Typically, that “something” is one of three species of catfish: channel, flathead or blue. While the flathead catfish are said to be the best for eating, it’s the blue with the biggest potential for growth. “It feels like a vice grip when a blue gets ahold of you,” Walls said. Blue catfish have the potential to live more than 20 years and grow to well over 100 pounds. The state record is 98 pounds for fish caught on a rod and line, while the biggest fish turned in at this year’s annual Okie Noodling Tournament in Pauls Valley weighed in at more than 58 pounds. “It’s like being bit by a dog,” Williams said. According to the Oklahoma Department of Wildlife Conservation, the biggest registered blue catfish caught in the state weighed in at 118 pounds eight ounces by means of a trotline. There are more than a dozen species of catfish swimming the Oklahoma waters, but it is just the biggest three that are targeted by noodlers. Channel catfish can live more than 20 years, but are by far the smallest of the three. 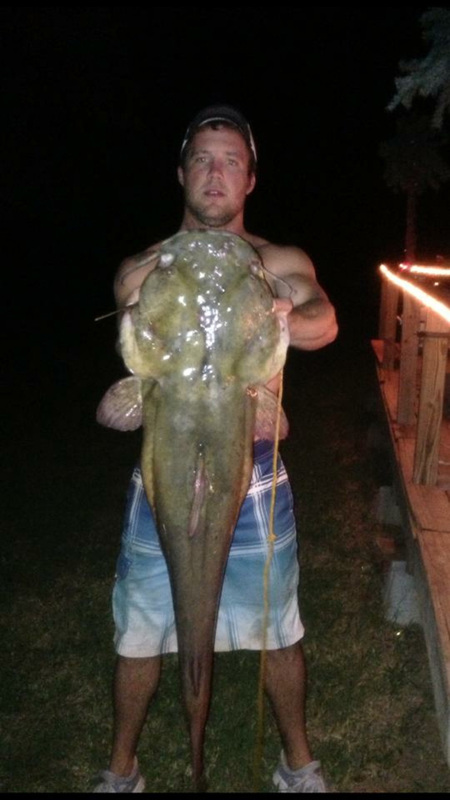 Flathead catfish also can tip the scales at more than 100 pounds and live up to 20 years. Having a 100-pound, or even 20-pound fish latch on to you while you are underwater would get the heart pounding. However, it’s not always just the man-sized fish that puts fear into people. Those who don’t participate in hand fishing often site snakes, turtles and beavers residing in similar holes as reason enough to not partake. Aside from whatever else might be in the water, the fish themselves do have some defense mechanisms in the form of teeth. Catfish have what is called villiform teeth, which are very closely crowded together and resemble the bristles of a brush of the hook side of Velcro. 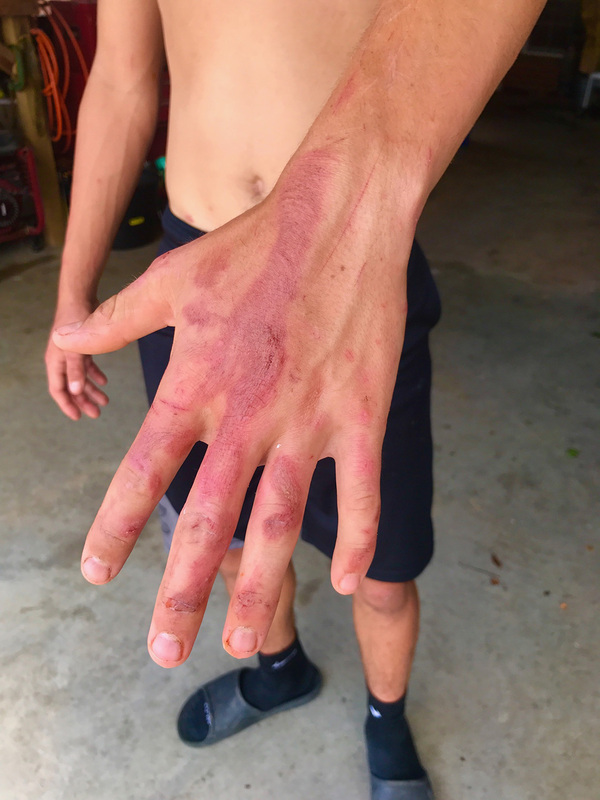 “Their teeth are more like sandpaper than needles, but when they get to thrashing around, especially if your hands are wet, they can do some damage,” Shoup said. Catfish also have pointy, boney spines that serve as support elements on their fins. Those spines can lock in place, which is a useful defense mechanism for smaller catfish, as it is difficult to swallow something with three spikes sticking out. Many people think catfish spines are poisonous and will do internal damage to whatever part of the body they stick. However, science tells us something else. The good news for hand fishers is the bigger the fish, the more blunt its spikes get and less likely they are to be stabbed. 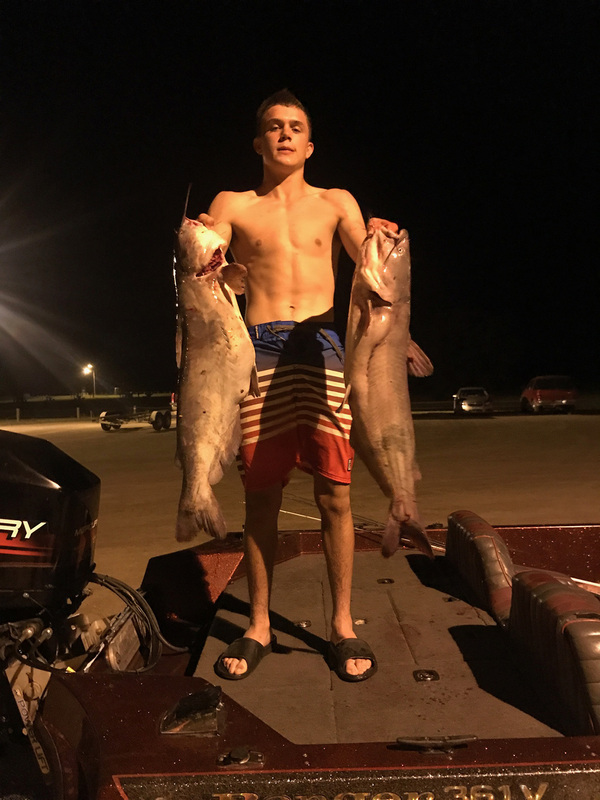 Some concern has come to the surface from surrounding states about the effect noodling has on catfish populations, causing them to outlaw the practice. Oklahoma, however is sticking to its culture of continuing the sport. Shoup likened noodling a catfish out of its nest to angling a largemouth bass off its nest. He said in a matter of seconds, little bluegill and other fish are chowing down on the bass eggs, oftentimes discouraging a male bass enough to leave the nest for good. There is no shortage of bass in Oklahoma. It’s an activity that has been passed down through generations of Oklahomans. Walls is no different, learning from his father, and neither are Ring and Williams, whose teenage sons are currently addicted to noodling. After a few more years it will be the kids gathered together, chopping it up and sharing stories of hand fishing. Catfish aren’t going anywhere and neither are those brave enough to catch them bare handed.